Are the days of the ATM (automated teller machine) numbered? Possibly not. 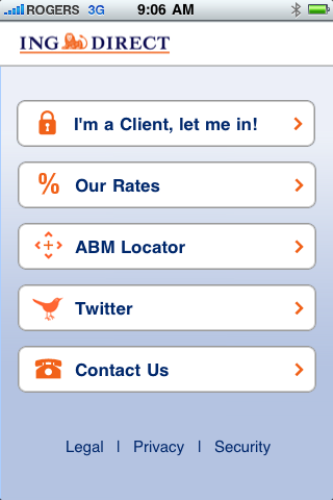 But with ING Direct’s launch of a BlackBerry and iPhone banking application, mobile banking in Canada just got another boost. Starting today, Canadian clients ofING Direct will be able use their RIM and Apple smart phones to check account balances, review transactions, transfer funds, get directions and hours of operations for ING Direct Save Your Money Cafés – and yes, help in locating the nearest ATM. The application is available for free download at the banks m.ingdirect.ca Web site. Free downloads can also be obtained from the BlackBerry App World and the App Store. The Amsterdam-based discount bank made popular in Canada by its TV spokesperson Dutch actor Frederick de Goot lays claim to being the first financial institution to offer a mobile banking app in Canada for both the BlackBerry and iPhone. However, Big Three member Canadian Imperial Bank of Commerce (CIBC) says it is the first major Canadian bank to offer full-featured mobile banking. The CIBC came out with a mobile banking app for the iPhone in February. “This app is so ING. We came into the market saying we will save customers money, now we are saving them time,” said Peter Aceto, president and CEO of ING Direct Canada. He said the app was developed by ING internally. ING entered Canada some 14 years ago offering customers then unheard of perks such as high interest savings accounts with no fees or service charges. Aceto said ING was encouraged to launch the app in Canada because numerous surveys have shown Canadians are early adopters of mobile technology and because of the traction online banking has gained in the country. “We think that Canadians will be using mobile banking more and more in the very near future,” the ING Direct Canada president said. Not all observers are impressed by the offering, however. “In terms of ING’s current product offering I think [mobile payment] is more of a ‘nice to have’ rather than a compelling feature,” said Rob Burbach, senior analyst, financial insights and buyer behaviour practice at IDC Canada. 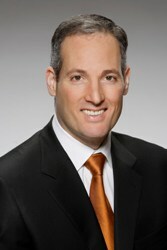 ING has been offering mobile banking through its Orange Direct browser-based service in the U.S. since 2007, and much earlier than that in Europe. Recent surveys indicate that the environment might be ripe for mobile banking in Canada as well. For instance, a 2008 poll by Harris/Decima points to growing cell phone usage in the country as a major driver for mobile banking adoption. Back then, the survey said more than 72 per cent of Canadian households had access to a cell phone. Only 44 per cent did in the year 2000. Mobile penetration is also getting deeper as each household has more than one cell phone, according to Harris/Decima. Mobile security as well as the quality of cell phones and range of styles have considerably grown in recent years. Today more than 22 million Canadians have cell phones. Two years ago, at least one in four phones in Canada were smart phones, according to IDC. A Mercatus study of the Canadian market indicates that nine per cent of consumers already have a mobile banking account and that about 20 per cent plan to start using one by 2011. He also said consumers must be convinced that they need mobile banking in order for the service to take off. On the issue of security, four months ago malware started infecting jailbroken iPhones belonging to online banking customers of ING Direct in Europe. The “Duh” or Ikee-B worm exploits an SSH backdoor of the jailbroken iPhone in order to turn the device into a botnet. There have been no reports of such attacks in Canada, according to ING’s Aceto. He also assured the bank’s customers that ING’s proprietary mobile app undergoes the same level of protection as the company’s other services.